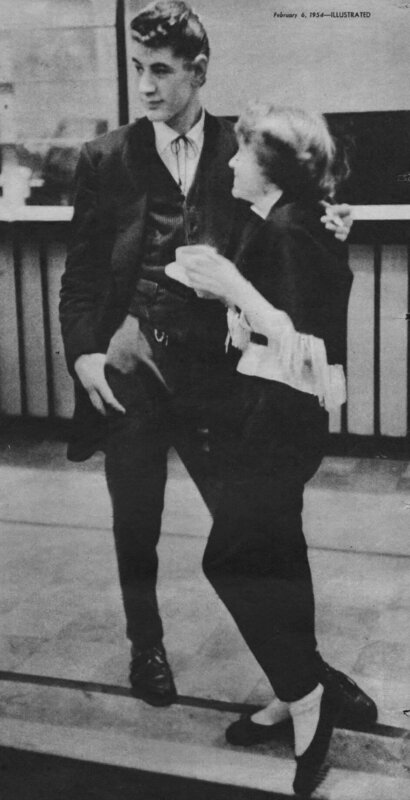 This page details the clothing worn by the British Teddy Boy and how this was adapted and developed from the Neo-Edwardian revival of August 1948 into something that became distinctive to working class youth of the 1950's. Teddy Boy, Mick Farrell wearing the original pre-1955 Edwardian fashion comprising of a wide lapelled Drape Jacket with turned-back cuffs and a velvet collar. Trousers are high-waisted pleated fronts with 16" turn-up bottoms. The outfit is complimented by a silk-patterned waistcoat with fob watch and chain. Derek Keates (known as the Sheriff) with his girlfriend Valerie Kitts at a Best Dressed Edwardian Contest in a Dance Hall at Tottenham , North London in 1954. 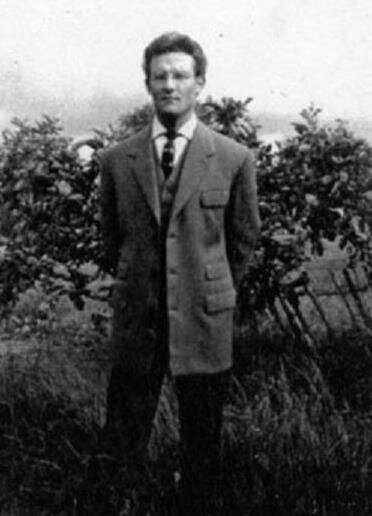 Derek is wearing a Drape jacket with a Velvet Rolled Collar and Half Moon Pockets and a genuine 'Bootlace Tie' and contradicts a number of writers who claim that this style did not exist until the late 1950's. Teddy Boys in the 1970's adopted this style in big numbers. The Teddy Boy was considerably different in terms of style from the original Neo-Edwardian era fashion which was started by Saville Row Tailors around August 1948. This was because the Teddy Boy fashion incorporated elements of American Western dress such as Maverick Ties and Silk Brocade Waistcoats worn by Wild West Gamblers and Gunslingers. It should be pointed out at this point, that the original Teddy Boys tended to wear a separate non-matching Jacket, Trousers and Waistcoat (as shown in the photograph of Mick Farrell above) as opposed to matching 3-piece Drape suits which tend to be worn by Teddy Boys nowadays. In Edinburgh during the 1950's the wearers of 3 piece Drape suits would have been referred to as 'Edwardians' and not 'Teddy Boys'. (see comments further below). Below is a description of all elements of the fashion worn. The original Edwardian Drape Jackets initially adopted by working class 'Edwardians' were slightly different from what would become universally recognised as a conventional Drape Jacket. This was due to the fact that they had a 'natural waistline' by being brought in at the waist as was the case with most other conventional jackets. Drape jackets also had skilfully built-up shoulders to give an unusually masculine appearance. The backs of the jackets initially had vents or no vents at all. An advert showing the original Neo-Edwardian style jackets with the 'natural waistline'. As time went on the 'natural waistline' was dispensed with by the Teddy Boys in favour of a full drape with straight sides and complimented in all cases with a full back with no seam and no vents. Drape Jackets have a full piece of material at the back which enables the jacket to hang in order to give its distinctive box like appearance. At this point vents at the rear of the jacket were done away with, which accentuated the square drape-like appearance. 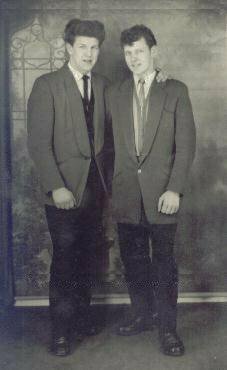 Two Teddy Boys from the mid 1950's both wearing plain Drapes without velvet. The jacket on the left is of a 'knuckle' length with a shawl/roll collar whereas the drape jacket on the right has curved lapels with a notched collar and half moon pockets. Both Jackets have a single-link button fastening. Drape Jackets in the early 1950's had lapels of between 31/2" and 4" wide with or without a velvet or moleskin collar. As time went on, lapels became narrower (in line with the Italian fashion which came to prominence in 1958) to as little as 11/2" or 2" wide. Jacket cuffs were generally made from the matching cloth or from velvet the same colour as the collar. These were a 2"-3" deep 'turned-back' cuffs called 'Double' or 'French Cuffs' (or what now is sometimes referred to as a 50's cuff ) with either a single button placed over the cuff at the top corner or a combination of a turned-back cuff and a working cuff with 4 buttons. A smart Teddy Boy on Canvey Island, Essex with a matching Drape Jacket with a 3 button front and matching Waistcoat and Slim-Jim Tie. The 'cut' of the jacket could either be single button link fastening or two, three, four or even five button fronts. The most common tended to be single link or four button fastenings, although most jackets were worn open without being closed in order to display fancy brocade waistcoats. The actual length of the jacket itself could be knuckle length, finger tip length (most commonly worn) or knee length. The early 1950's Neo-Edwardian suit was tailored in sober colours, the colour scheme for these youths was black and white. A crisp white shirt was worn with a jacket in black, shades of grey, navy blue or maybe dogtooth check. This colour range was somewhat different to the late 1950's when Teddy Boys started to wear a greater range of colours such as Powder Blue, Maroon and even Purple. This was partly due to the fact that more dyes had become available in the late 1950's and young men in the early fifties would see suits and jackets in brighter colours as effeminate. Pockets were generally either 'flap' pockets with either one or two breast pockets and two flap hip pockets sometimes with a complimenting ticket pocket. The pockets could be placed straight or they could be placed sloping diagonally. Sometimes a conventional 'welt' pocket was worn generally as single breast pocket (although sometimes double breast welt pockets were worn) with a complementing white 'handkerchief'. 'Jet' pockets were also commonly used for breast pockets. A selection of posed photographs of Bristol Teddy Boys circa 1957/8 which shows little use of velvet on the jackets and flap pockets still in evidence. As time progressed Jet Pockets without flaps came into fashion and this meant that in many cases all pockets worn on Drape Jackets were of that type. Some Teddy Boys were able to get the Jetted effect by simply folding in the flap pockets which achieved the jetted image without removing the flaps from the pockets. In the late 1950's flap pockets became narrower in line with the narrowing lapels. Also more velvet started to be worn with velvet pockets coming to the fore in the late 1950's. 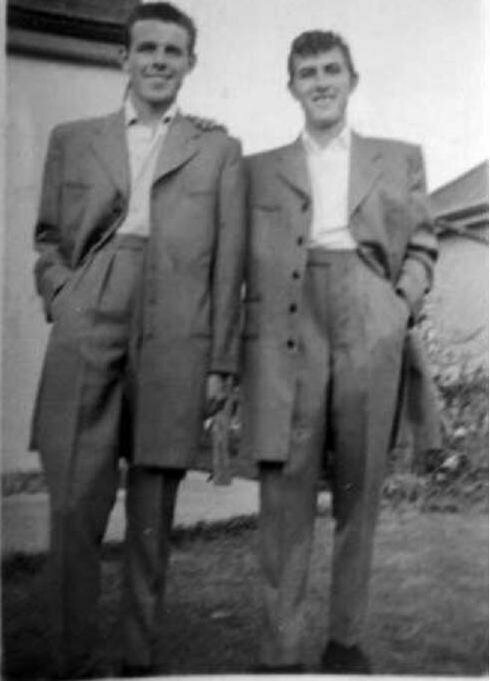 Brian W. & David B. from Canvey Island, Essex wearing high-waisted trousers. No velvet is present on the Jackets and they are of a high lapel five button fastening. Eddie Terry originally form Canvey Island comments: "We might have looked prats but at least we were smart looking ones. (a matter of opinion) One thing I will say and that is us Canvey boys were always smartly dressed. The group I went with all bought our suits from Maxie Cohen "Bespoke tailor" who's shop was beside the trolleybus terminus at Algate (by the underground station) this involved two or three fittings before you picked up the suit so we always made a day out, staying to have a few beers in that area." "When we first went to Maxie and told him what we wanted i.e. single breasted, one button, velvet collar, fingertip length and drainpipe trousers he must have thought we were barmy but our money was good and we got on well with him also buying our Crombie overcoats from him too. I also think we must have been egotists because whenever we took out overcoats or jackets off we always folded them so the large Maxie Cohen label was on the outside." Trousers were generally worn high-waisted and with braces or sometimes a belt and were known as 'stovepipes'. The front of the trousers were double pleated and had slanting side pockets with rear flap or jetted pockets. Trouser bottom widths in the early 1950's were 17" or 18" bottoms and as time went on 16" bottoms became standard and these trousers would generally have turn-ups at the bottoms. The idea that Teddy Boys wore 14" bottoms in the early 1950's is a misleading notion as 14" bottoms actually came in during the mid 1950's onwards. The favoured shirt worn was a white shirt with a cut-away collar and also a high-necked loose collar on a white shirt (known as a Mr B. collar because it was often worn by jazz musician Billy Eckstine). Both types of shirt were complimented by a narrow Slim Jim tie or Maverick tie. 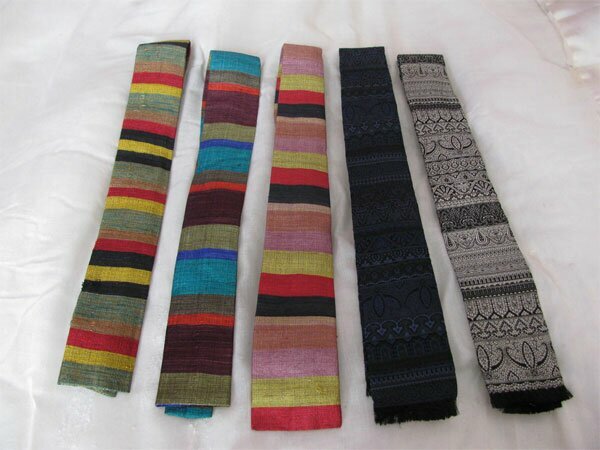 A selection of colourful square bottomed Slim-Jim Ties. Waistcoats varied in style from single breasted with either no collars or notched lapels to shawl collar. Double breasted waistcoats were popular with lapels of both shawl collar or notched design. Many of these waistcoats were made from brocade silk patterned material which was a type of waistcoat worn by American Wild West gamblers and gunfighters. This was always complimented by a 'Hunter' pocket watch and chain. The chain could either be of a Double Albert type or a single chain design with fob. In the early 1950's these brocade waistcoats added brightness and colour to the otherwise sober colours of the Jackets and Suits worn by the early Neo-Edwardians. 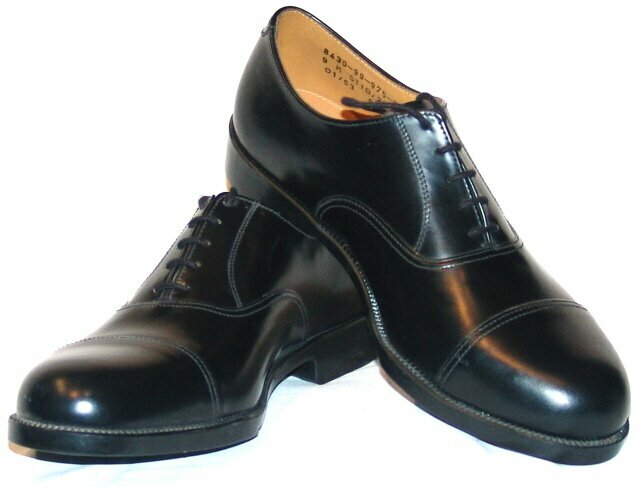 The original Teddy Boy shoe was a plain black Oxford shoe which was worn throughout the early fifties and still remains popular to this day as a conventional smart shoe. This gradually gave way to the wearing of heavy soled brogue shoes. A pair of traditional Oxford shoes worn by Teddy Boys. Alongside these shoes, crepe soled shoes commonly known as 'Brothel Creepers' of 1" wedge were often worn in suede have always been associated with and worn by Teddy Boys. Shoe manufacturing companies such as Denson, Ladd's, Eaton and later George Cox had been making 'Brothel Creepers' from the early 1950's onwards. 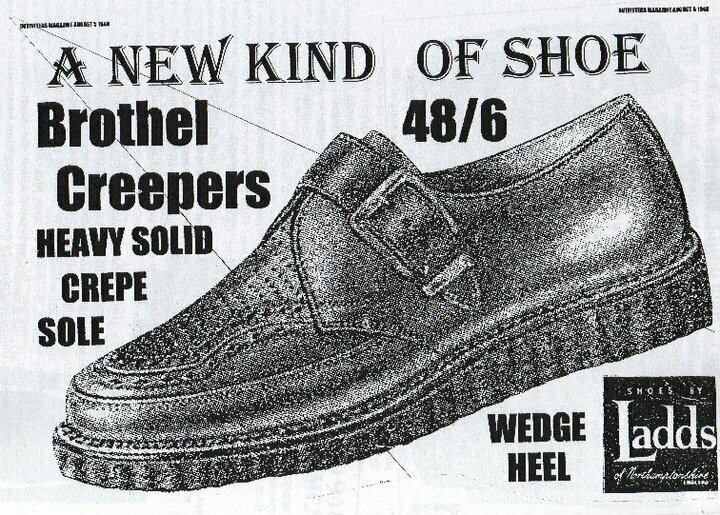 A pair of Ladd's Brothel Creepers with a ribbed sided crepe sole. 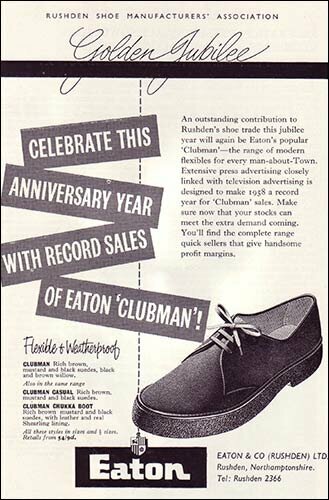 The Eaton 'Clubman' and Eaton 'Chukka Boot' were a crepe soled shoe that became a favorite worn by many Teddy Boys. These shoes were manufactured by Eaton & Company of Rushden, Northamptonshire. These shoes are still available, but are manufactured today by the famous Creeper shoe manufacturer, George Cox of Wellingborough, Northamptonshire and are known as 'Pop Boy' Shoes. Traditionally, Teddy Boy clothing has always been typified with finger-tip length 'Drape Jackets', that were worn usually in darker shades in the early 1950's, with or without a black velvet collar and cuffs and pocket flaps; high-waist 'stovepipe' or 'drainpipe' trousers, often exposing the socks. As the fifties progressed however, lighter colours for Drape Jackets and Suits such as Powder Blue and other colours started to be worn and become popular. All of these clothes were mostly tailor-made at great expense and paid for through weekly instalments. 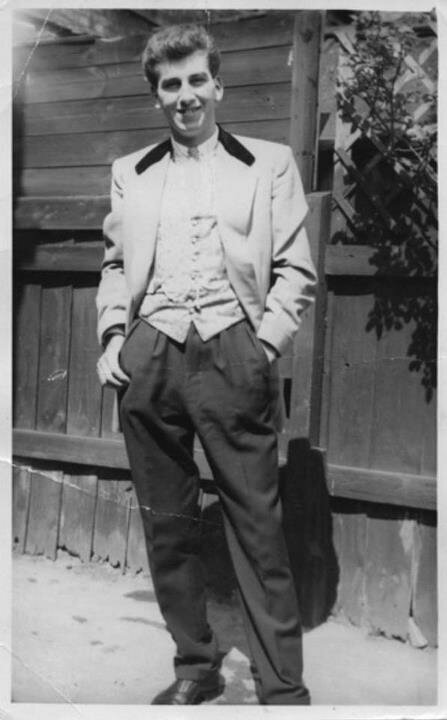 Initially, it was difficult to buy a suit in the Teddy Boy style as ordinary tailors did not make them. Montague Burton, supplier of cheap mass produced tailored suits, tended to be much more conservative. 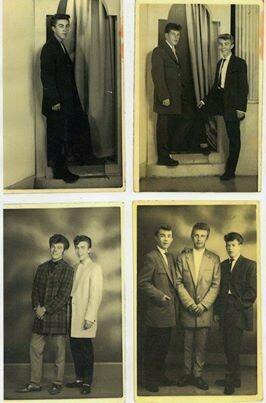 Young men had therefore to go to a backstreet tailor or a shop that specialised in Teddy Boy gear. Moreover, the outfit was expensive. At a time when the average weekly wage was £5 2s 5d., 'a proper Ted suit would cost between £15 and £20., hand-made by a back-street tailor, and all the accessories would double that. If you wished to make a top Ted, you had to be prepared to stroll into a dance hall with £50 on your back. The contrast between the Teddy Boy Style and the Edwardian Style. Comments made by Frank Ferri and John Clark who both grew up in Edinburgh during the 1950's on the contrast between the Teddy Boy style and the Edwardian style. - Guys' suits had to be made to measure, strictly no off-the-peg, generally they were bought from Jackson's in Leith Street, considered by most to be the best. They usually took on average at least 8 weeks to make. However, it gave you time to save up the money. - The moderate guy's suit was a one piece back, thumb length drape jacket, roll collar, with single link button, trousers 16 inch bottoms. Popular colours were Silver Grey, Midnight Blue or Charcoal Grey. If it was Charcoal, then a Scarlet or Mustard waistcoat was worn. - The extremists went for velvet jacket lapels and 14 inch trouser bottoms, among other embellishments. - A white shirt was a must, no colours then, and a tasteful striped tie, then slip on casual shoes to finished your attire off. - In the late 1950s / early 1960s, Munrospun (company near Kemps Corner) ties were very fashionable. Generally, these had to be coloured either Mustard or Scarlet. I was lucky. My sister in-law worked for the company. I got mine discount so I had every colour." "In contrast, the Edwardian young men favoured Burtons the Tailors, the most popular being opposite Patrick Thomson's. They chose the best quality material, and yes it took about 8 weeks to be made. You were measured and fitted exactly to your wish. - It was a long jacket with a high lapel cut, which showed only about 5 inches of shirt. - It was a full back, no seam and no vent, with four or even five buttons in front. Some went for the velvet collar, but most preferred not. - The pants were slim all the way to the top, and depending on the size and girth of the individual, they were usually 16 or 17 inch bottoms. - The shirt was Italian, and white. - There was a waistcoat worn, which was only seen if all the buttons of the jacket were undone, and it would match the jacket perfectly. - The shoes were Italian, and if you held them, you could bend the heel to touch the toe easily. - Many opted for a pocket watch held in the waistcoat pocket, with a gold chain. - They also kept quite short haircuts for that time. Oh yes, they were dandy boys, but they sure knew how to dress!" Towards the end of the 1950's when the number of Teddy Boys had started to dwindle, many of those remaining Teddy Boys had started to adopt brighter colours with narrower lapels and trousers. This is the time when Ice Blue, Maroon and Bottle Green drape suits became popular with black velvet trim with 2" lapels and 14" bottom trousers. This particular style would then set the scene for the re-emergence of the Teddy Boy some 10 years later in 1967 when the identical style became re-adopted. However, during the 1970's, the Teddy Boy style had become somewhat bastardised compared to the original Edwardian Teddy Boy of the early to mid 1950's where jackets were characterised by much more sober colours of black, grey, navy blue and plaid checks. This 1970's Glam Rock image was started when fashion designer Vivienne Westwood had started making glam Teddy Boy clothing for Malcolm McLaren and in 1971, they opened a shop called 'Let it Rock' at 430 Kings Road, London. As a result, the 1970's drape jackets were heavily influenced by this glam rock image which had perpetuated 1970's popular culture and much brighter colours were then worn. These colours included Scarlet Red, Royal Blue, Canary Yellow and in some cases the jackets had Lurex and Leopard skin trim in place of velvet. Generally however, greater use of velvet however was worn on both collars, pockets and cuffs, all in velvet of varying colours. Many Teds in the seventies wore black drape jackets with red velvet, however black velvet still predominated as being the popular trim. The use of Vandyke cuffs on Drape Jackets became popular as opposed to the original 50's cuff or French double cuff of the 1950's. There was also a predominance of drape jackets with velvet rolled collars and velvet edged half-moon pockets. Trousers were generally of 14" bottoms with very few who would wear turn-ups. Many Teddy Boys in the 1970's were wearing Bootlace (or Bolo) ties with their suits as opposed to 'slim jim' or 'maverick' ties worn in the 1950's. 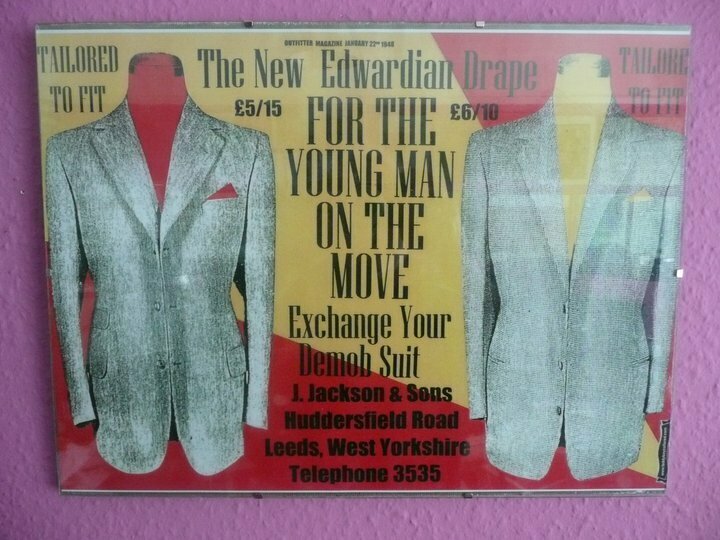 As time went on there was a move back towards the original 1950's style which started in the 1980's amongst Teddy Boys who had become disillusioned with the brighter and more colourful 1970's style of dress and then in 1992 promoted by The Edwardian Drape Society. This original style dispensed with all the trimmings and many Teddy Boys slowly started to go back to their roots and adopt the original Edwardian look of 1953/4. As a result of the interest by many Teddy Boys in the wearing of the pre 1955 style of Neo-Edwardian attire, many of those Teddy Boys who have chosen to retain and wear the brighter 1970's style of dress have accused these Teds of being elitist. However, this could not be further from the truth, the objective of those Teddy Boys who have chosen to wear the original pre-1955 Neo-Edwardian style is simply to return to their Teddy Boy roots, so as the style is not forgotten. Which ever style of Teddy Boy attire, a Ted wishes to wear is quite simply their choice and shows individuality based on a common interest and theme. The wearing of different styles should not continue be the cause of disagreement or controversy within the Teddy Boy Movement that it has been in recent years.